The Robin family has had more heartbreak. After relocating their nest from our front door to the maple tree, apparently one of the new babies fell onto the ground just outside the fence. 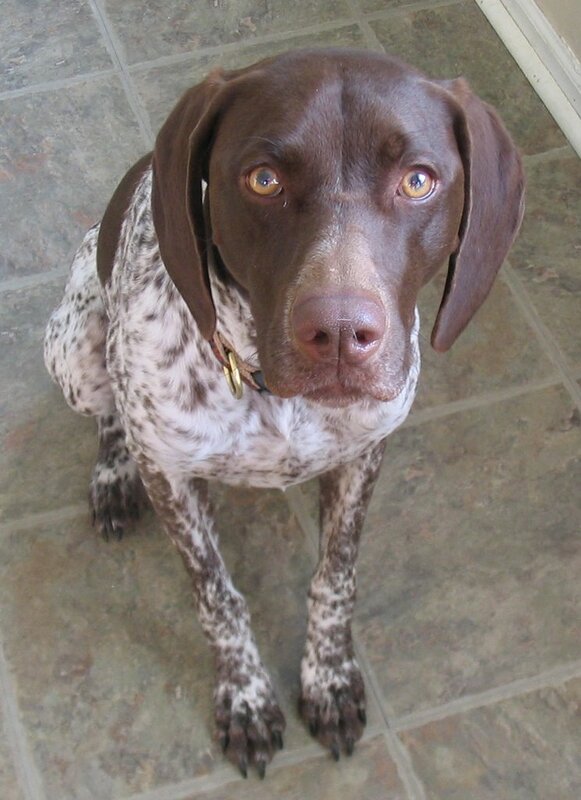 Kenn’s friend took Riley for a walk one day while we were gone, only to realize on their return that there was something in her mouth. (You can see where I’m going with this). Riley must have heard the rustling in the leaves and put “eat the birdie” first on her to-do list for when she got outside the fence. Do you kiss your mother with that mouth??? 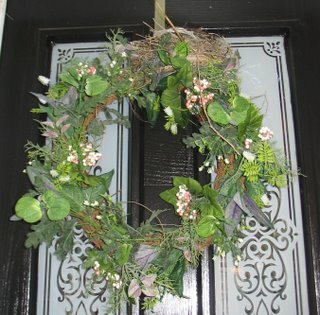 Notice anything unusual about the wreath on our front door? When I went out to water my flower boxes last night I noticed pieces of trash and sticks scattered on the stoop, then turned around to find that a robin had built a nest on top of the wreath while we were gone. Looks so natural, huh? I took a picture of the inside of the nest, which looked almost complete but the mud was still wet. No eggs. This morning I watched the robin through the glass panels as he fussed around with the nest. A few minutes ago I gently opened the door to check the mail and found that the nest had fallen on the ground sometime this morning. How sad. I’m going to leave it there (and the base of it that’s still in the wreath) in case he wants to have another go at it. 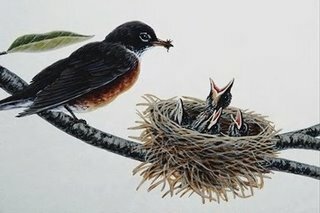 Update: Mr. Robin was back at work on the nest at lunchtime, so we’ll see what happens. I would love to have little blue eggs and robin chicks, but I may have to stop using the front door. 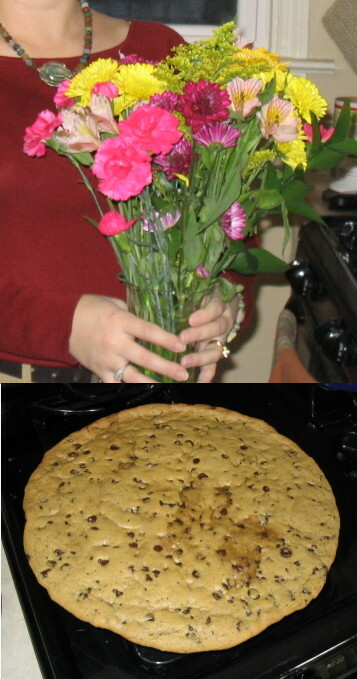 I’m 28 today and my husband gave me flowers and made a cookie cake. Isn’t he sweet? His birthday is on Tuesday, so I’ll get him back. I’ve noticed a lot more Canadian geese than I have in years past. Some days thousands of them will stretch across the sky. Another thing I noticed this year is that they are flying in all different directions, not just south. I actually saw one V fly directly into another V, apparently at the same altitude because the birds all scrambled like they were in combat. It finally occurred to me today that maybe we are The South. Geese don’t care about the Mason-Dixon line, and being “Canadian” I guess they think Delaware is relatively warm. The geese have been encamped at Battery Park, and when Riley and I get close they slooooowly move out into the river (just in case I drop the leash). They do this nervous quacking thing, as if to tell one another, “Dog… dog… dog…” like the seagulls in Finding Nemo.